Rev. Percy McCray Jr. has spent more than 20 years ministering to cancer patients and their caregivers at Cancer Treatment Centers of America® (CTCA). He recognizes cancer care ministry as a special calling from God and considers faith a key, but often overlooked, component of cancer treatment. His engaging personality and deep passion for pastoral care ministry has made Rev. McCray a favorite among patients, pastors and his podcast audience. He now serves as the Director of Faith-Based Programs at CTCA® and provides leadership to the pastoral care staff at all five CTCA hospitals. In addition, Rev. McCray oversees Our Journey of Hope®, a nationwide cancer care ministry training and support program. An ordained minister, Rev. McCray is a member of the U.S. Chaplain Association. 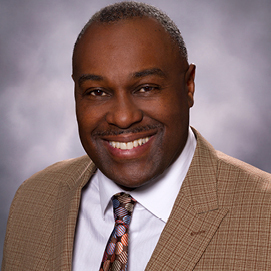 He has been recognized as one of the “most influential African Americans in Lake County (IL)” by the People’s Voice newspaper for his religious and leadership roles within the community.